Omni Builders is a Southeast Michigan Builder who often uses post frame construction to build garages and other structures. As professionals, of course, we know what post frame construction is and why it’s such a great idea. If you’ve been hearing about this type of construction and wonder what it is, you’re not alone. We’d like to explain what post frame construction and why it’s a great idea. If you browse around for information, you’ll see that it’s often said that post frame buildings are engineered with wood frames and sometimes use laminated columns. But you’re probably now asking, what does engineered with wood frames mean? Here is some information that we hope will help clarify things and why post-frame construction is perfect for garage building. Have you heard of a pole barn? Post frame construction is the same type of building technique and in fact, the terms are interchangeable. You’ve probably seen pole barns, which simply mean that the structure is supported by large poles or posts instead of being supported by traditional timber framing. Post frame construction may be done by burying posts in the ground or on a concrete foundation. The poles, or posts, support the structure vertically and girts are used for horizontal support to help the structure resist wind loads. Engineered, as in engineered with wood frames, just means that they are designed by an engineer to support a heavy load very effectively. This type of structure can be larger and heavier than traditional structures because of the strong support of the poles, posts, or columns. Although post frame construction is a perfect technique to build any structure including homes, it’s especially perfect for a garage. It is much less expensive than adding a garage onto the home and it’s worlds better than a carport or typical shed. They are strong and durable, cost-effective, convenient, low maintenance, and versatile structures. 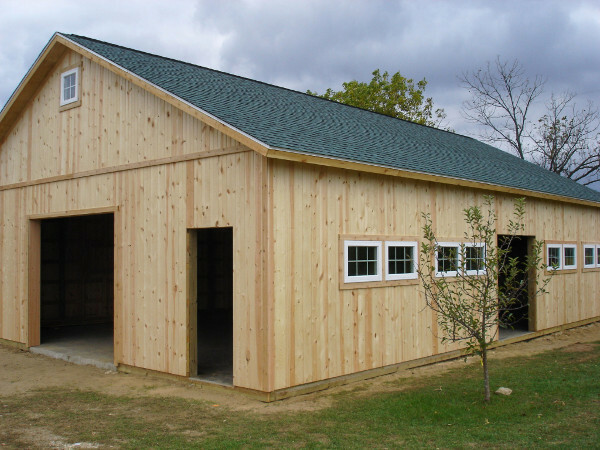 This type of garage building can be customized in many ways to serve other purposes such as additional storage or for gardening and lawn equipment. Since they look just like a garage that can be matched to the siding and colors of your home, they fit right in with the aesthetics of your property. All types of buildings are constructed today with post frame construction including homes and commercial buildings. The modern development began in the 1930’s for housing, churches, picnic shelters, or storage buildings. But today, banks, churches, restaurants, offices, garages, tool sheds, retail stores, and other buildings are made with post frame construction. As we mentioned, the exterior siding can be clad to match the home’s siding. The interior can be finished any way you want it, so walls can be built, HVAC systems installed, and plumbing for bathrooms and kitchens can be installed. Need a new garage or a guest house? You should check into post frame construction as an affordable, durable option.